The consumer durables value chain in the UAE encompasses mainly distributors, power retailers and resellers (online and offline), while manufacturing is not present. Apart from re-exports domestic demand is driven by expatriates, tourists, regular shopping festivals and speciality electronic retail events. Many distributors are present in Dubai’s free trade zones and redistribute to the wider Middle East and Africa. 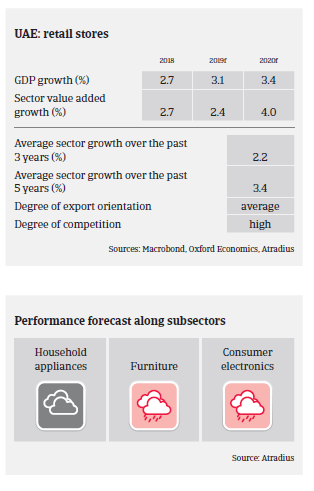 It is expected that sales growth of consumer durables in the UAE will remain subdued in 2019, due to modest private consumption growth and a difficult economic environment. Tourism inflow growth is sluggish compared to previous years. Competition continues to remain high, and distributors and retailers have lowered sales prices in order to maintain turnover. This led to decreasing profit margins in 2018, with no rebound expected in 2019. Consumer durable distributors selling in the UAE and re-exporting (mainly from Dubai) are reliant on bank financing to support their inventory and receivable days. However, banks have become more restrictive in their lending approach to the industry as many businesses (mainly from Dubai) have cash flow issues due to weaker demand. Payment duration has increased to 90-120 days (payment terms are usually 60-90 days). The number of payment delays and protracted defaults is expected to remain high in 2019 due to ongoing cash flow problems and more restricted access to bank loans. Our underwriting approach for the household appliances segment is generally neutral, as we expect demand to remain stable. However, we have adopted a cautious and selective underwriting approach for furniture and textiles/footwear retail. Both segments consist of many small and uncompetitive businesses. We are also restrictive for consumer electronics, as we have seen many sizeable runaway cases (especially in Dubai) in the recent past. Our underwriting approach is also cautious for distributors and resellers exporting to high political risk countries in the Middle East and Africa. The imposition of new taxations and customs duties on certain consumer durable items in India has impacted demand from the UAE. Across all subsectors, availability of the latest audited financials, updated trading experience and knowledge on the buyer business model is required for positive review. Economic growth is expected to accelerate in 2018 and 2019, due to higher oil prices, stronger external demand and the easing of fiscal consolidation.